This is the story of the National Union of Boot and Shoe Operatives (NUBSO). By the nineteenth century, a number of local or sectional unions had emerged in the shoemaking trade – typical of which were the Edinburgh Operative Cordwainers, formed in 1822, and the Amalgamated Journeymen Cloggers, dating from 1830. But the most important of the early unions was the Amalgamated Cordwainers Association. Founded in 1840, its members were the skilled craftsmen responsible for making handstiched shoes and who looked down on the new mass-production techniques that emerged from the 1850s onwards. 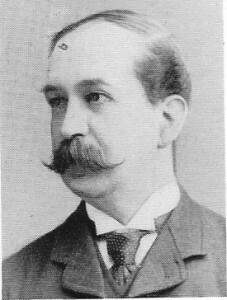 Thomas Smith – General Secretary 1874-78. As a result, the Association found it difficult to recruit the riveters and finishers who worked in the more down market parts of the industry, and vacillated between making efforts to recruit them (not least by changing the organisation’s name to the Amalgamated Association of Boot and Shoemakers in 1873) and obstructing efforts to organise them. This underlying hostility led in December 1873 to a split, when 25 representatives from branches as far afield as Glasgow, Newcastle, Chester, Bristol, Norwich, Leicester and Northampton met in Stafford to form the National Union of Boot and Shoe Rivetters and Finishers (NUBSRF). The new union – whose members called themselves “The Sons of St Crispin” – soon had 4,000 members in 35 branches. By 1875 they were able to establish a funeral fund, and offer sick pay of 10 shillings a week. By 1887, membership had grown to just under 10,000, and continued rising rapidly until 1895, when progress was halted by a combination of factors, including rivalries between G E Green (formerly General Secretary of the Gneral Union of Clickers and Rough-stuff Cutters, which had merged with the NUBSRF in 1892) and William Inskip, the NUBSRF General Secretary, which culminated in Green leading the London clickers out of the union in 1898. 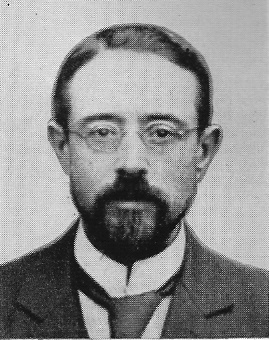 W B Hornidge – President 1893-99; General Secretary 1899-1908. A further factor was the strike in 1897 for a minimum wage, a 54-hour week and constraint on the part of the employers in the employment of cheap child labour. The strike lasted for 34 weeks and resulted in the workers returning to work having achieved little. Following this defeat the membership of the union fell dramatically and did not recover the 1897 level of membership for more than a decade. With the industry heavily reliant on casual labour, it was difficult for the union to prevent employers undercutting rates. By 1898, when it affiliated to the General Federation of Trade Unions, the union had changed its name to the National Union of Boot and Shoe Operatives (NUBSO). The fortunes of NUBSO waxed and waned through national and local disputes and agreements, but meanwhile the old cordwainers’ body fell into decline. In 1916 the Amalgamated Association of Boot and Shoemakers approached NUBSO in search of a merger. Despite the misgivings of some at NUBSO, the larger union agreed to absorb its older but smaller sibling along with its £500 debts. The early half of the twentieth century was a good time for NUBSO. Between 1914 and 1918, membership rose from 49,000 to 83,000, and again to more than 100,000 by June 1920 (although these figures included men enlisted and conscripted into the armed forces who remained in benefit at the union’s expense). Throughout the 1920s and 1930s, membership remained within a range of 77,000 to 80,000 at any one time. But the union was becoming better organised. The total number of full-time local officers rose from 42 in 1920 to 52 in 1934. Things would take a turn for the worse in the second half of the century, as cheap imports all but destroyed the British shoemakeing industry. In 1971 NUBSO joined forces with the Amalgamated Society of Leather Workers, the National Union of Leather Workers and Allied Trades and the National Union of Glovers and Leather Workers to form the National Union of Footwear, Leather and Allied Trades. Following a further series of mergers, the union is now part of Community, which organises workers in fields as far apart as the clothing and steel industries. A History of the National Union of Boot and Shoe Operatives 1874-1957, Alan Fox (Basil Blackwell, 1958). 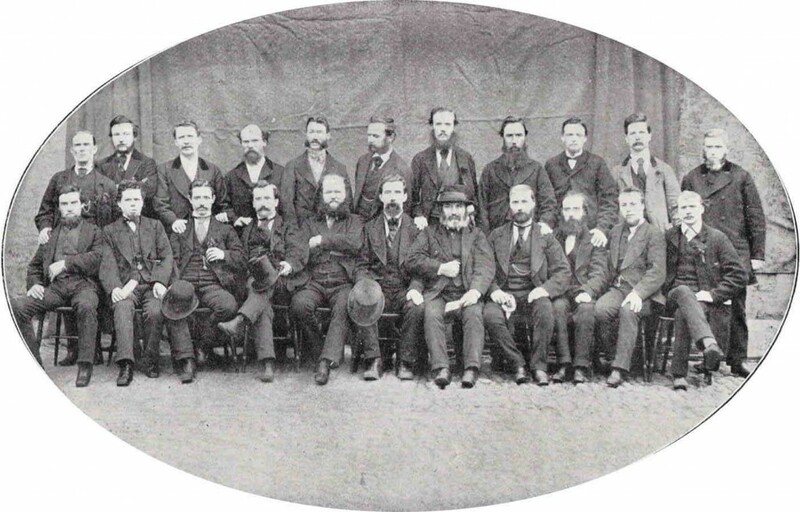 Delegates to the first conference of the National Union of Boot and Shoe Operatives at Northampton in 1874. They are J Chapman (Hull), G Sedgwick (Birmingham), J W Gardner (Manchester), H Greenwood (Stafford), F Weare (Wolverhampton), H Clements (Walsall), J Tilley (Leicester), J Forbes (Dundee), J Bosworth (Ansty), N Coyne (Nottingham), J Irving (Arbroath), J Kelly (Dublin), A Clark (Leicester), J O’Hara (Glasgow), T Smith (Stafford), J Simmons (Leicester), M Leader (Leicester), W C France (Northampton), C Smith (Leicester), J Collins (Newcastle), J Breward (Newcastle), T Heron (Bristol).